Feeling a little wistful for warmer weather and dreaming of summer apricots, today I needed to bake something nostalgic. Using all the eggs our girls our laying right now. Things are a little sad at the chicken house, as we lost two of our roosters this week. Spike, our lovely handsome Barnevelder rooster and his son, who had no name and was shunned to live on the outer, are now both gone. Mauled to death by a dog. And while yes, there is a sense of relief that the early morning crowing has stopped, I can't help but think what a dreadful way for the poor creatures to die. Despite my feelings of grief over the roosters, the hens are laying like the clappers and we're enjoying the bounty of at least eight eggs a day. We fry them for breakfast, make Spanish tortillas for tea, and bake plenty of cakes. 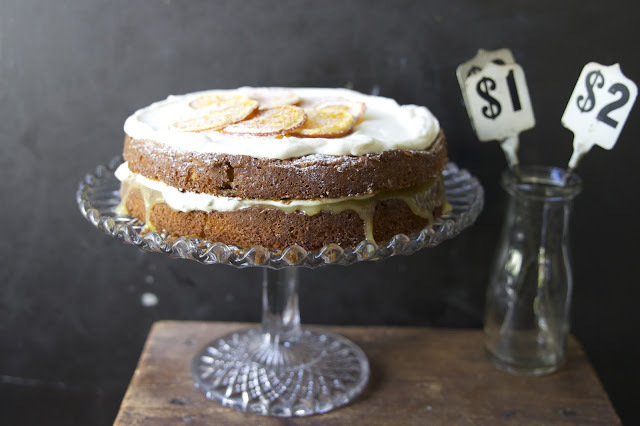 Like this Victoria sponge, filled with a jar of last summer's apricot jam and plenty of billowy whipped cream. This morning, as I fed the hens, I was greeted by the most lovely of surprises, a mother hen with two little chicks, so sweet and fluffy. So lovely to see new life and along with the cake cheered us up no end. Lessons learned today. Life goes on in the chicken house and cake makes everything better. This is my go to cake recipe, hands down. I make it all the time and I love it because you don't need a recipe. The weight of your eggs determines the weight of your other ingredients. You can vary the flavor by exchanging fresh fruit filling for jam, or any berries with cream would be delicious. And for a lemon cake use lemon zest instead of vanilla in the cake batter. Take three eggs and weigh them in their shells. This weight will be the weight you use of sugar, butter and flour as well. Preheat oven to 180C. Grease and line two 20cm sandwich tins. Beat sugar, butter and vanilla in a stand mixer until creamy and fluffy. Add eggs, one at time, beating well after each one, about 20 seconds. Slowly flour, a third at time until well incorporated. You may need a splash of milk here to soften the batter. Divide the mix between the cake tins, place into the oven and bake for about 20 minutes until risen and golden brown. The cakes should spring back when gently pushed in the middle. When ready, remove from the oven and allow to cool for 5 minutes in the tin, before turning out onto a wire rack and cooling completely. Spread the jam onto one cake and top with the cream. Sandwich the cakes together and dust with icing sugar. This post brought back such a lovely memory. About a year ago I baked this from your book and shared it with my parents in the sunshine one lovely afternoon. Thank you for sharing.